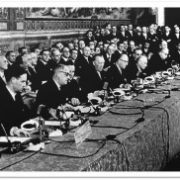 On 25 March 1957, the representatives of six states Belgium, France, Italy, Luxembourg, Netherland and, at that time, West Germany, signed two treaties in Rome, establishing the European Economic Community (EEC) and the European Atomic Energy Community (EURATOM). Treaties of Rome represent the cornerstone of the modern Europe. On one hand, a common market has been created, symbolised by four freedoms: free movement of people, goods, capital and services. On the other, joint research in the field of atomic energy for peaceful use began. As a result, the citizens of the European Union enjoy one of the highest living standards and, most outstandingly, live in a peaceful area. 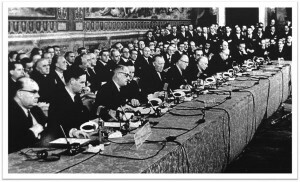 The European integration was already stated in the preamble of the Treaty establishing the EEC, in which the signatory states were “determined to establish the foundations of an ever closer union among the European people”. The Interreg ADRION programme is honoured to be part of this European vision and to contribute, together with its Partner States, to the future of Europe.